You know how you can be visiting a blog and see a link to something interesting, go to it.... and then you see a link to something else? I can waste a lot of time doing that, but sometimes it's well worth it. Only, how did I get here? 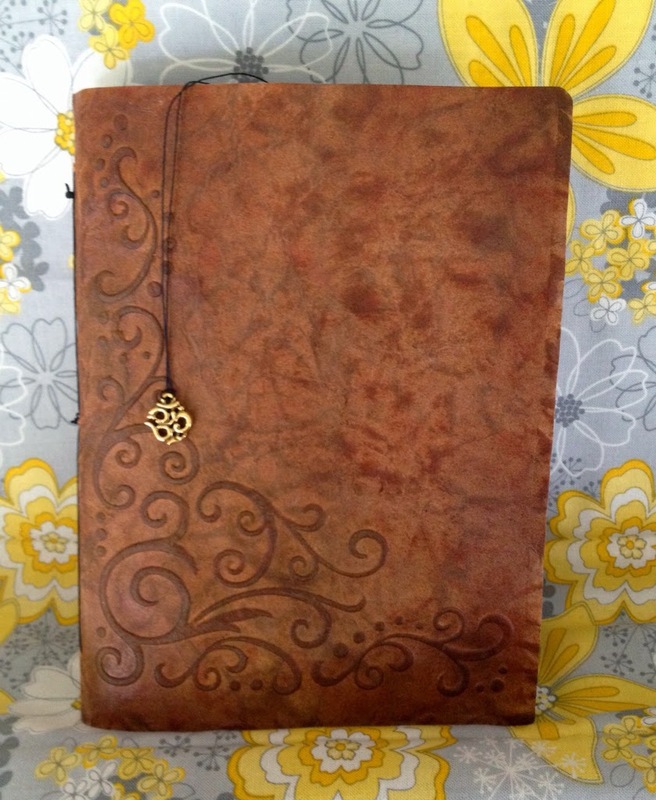 I found a link to Jenna Wheatman's blog where she had been making faux leather. She linked to Sheena Douglass' YouTube tutorials. It's actually made out of cardstock, some glycerin, water, inks and sealer. Along the way you run it through your die cutting machine with an embossing folder. Of course, I needed to try it right away. The video warns you need good quality heavy craft cardstock. I had some craft card, but not very heavy, I'd guess about 50#. It's color was also a little on the light side, but hey, gotta try it right? I should have ordered some from Crafters Companion right then and there. After all, I still had to find the glycerin, but I thought that would be easy to get at the local grocery or pharmacy. Turns out I tried 5 different places before I found the glycerin at Bi-mart (a local, quirky, variety store). I tried a few different sized embossing folders and likewise a few different sized journals. I used Darice scroll flourish corner, Cuttlebug stylized flowers and preserves - pears, and Sizzix pear and birds. In addition to Ranger Distress inks and Adirondacks, I also used a Copic air brush to add some more color. I tried some sealer with glitter in it and surprisingly liked the effect, so I also tried some Lumin Arte shimmering mist before a regular gloss sealer. I was really liking the look, but I still had the issue of the paper being fairly lightweight. Even though you glue cotton to it for the inside cover, I didn't think it would be strong enough. My husband suggested Tyvek, but that brought up another issue of adhesive. After some research online, I went with 3M Super 77 spray adhesive. I ended up with a 3 layer cover, Tyvek sandwiched in between the faux leather cardstock and the cotton fabric. Next for the bookbinding. I initially followed Sheena's YouTube for that as well, however after 2 books I realized I preferred the knots to be inside and not outside, so I simply started my needle through the inside of the signature vs from the outside of the cover. When you watch the video it will make sense. 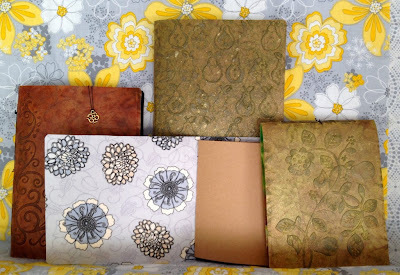 I made four journals and still have two covers left to add signatures. I found some great YouTube book binding videos from Sea Lemon. I'm gonna have to try them out. No telling where that will lead me. Oh, and next time, I'm going with the better quality, heavier card from Crafters Companion. I'm ordering some today. Not to worry about the other light weight craft card I already have, I used some of it for the signature pages and it looked great. I'm so glad you had a go and can see you have also become hooked. Your covers look great. 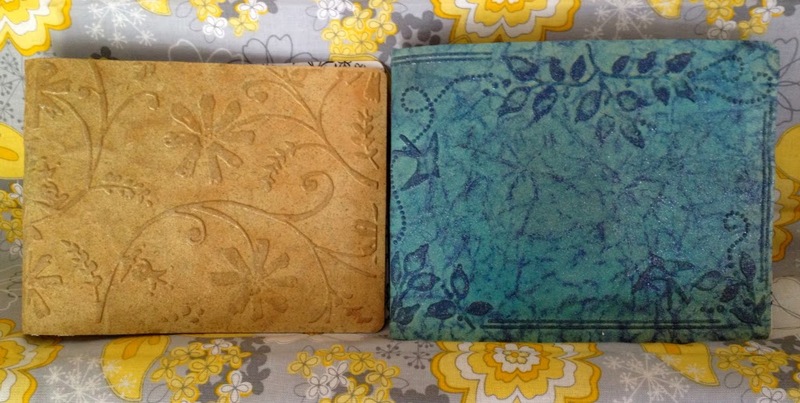 My mum has just made one into a passport holder which she has posted on her blog http://juliewheatman.wordpress.com/2014/04/27/in-the-craft-room-26th-april-2014-sheena-style-the-finale/ our craft group are planning another fleather session in a few weeks, I wonder what else we can fleather? LOL! Which came first, the phoenix or the flame?